Fall fly fishing in the interior lakes can offer some of the fastest action of the season and the best chances for catching big fish. Even the most popular lakes are relatively uncrowded, often you are the only person fishing the lake that day. Weather conditions are the biggest factor in having an enjoyable day on the water as well as dictating whether the fish will be active or dour. How late can you fish a lake? I have had great success fishing lakes that had only a 2 acre patch of open water left. 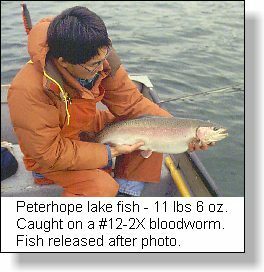 My most memorable day of fall fishing occurred on Peterhope lake several years ago. My fishing partner and I arrived at the lake on the particular late October day. It was cold but the winds were calm and blue skies were evident for as far as the eye could see. We were a little surprised to see about 30 metres of ice had already formed out from the edge of the lake. We quickly got the boat unloaded and pushed it out over the rather thick shore ice. No fish were moving on the surface so we motored out to the drop-off and then began slowly motoring parallel to the edge of the drop-off searching for cruising fish. Peterhope lake is one of the clearest lakes in the southern interior of B.C. making it easy to see fish with Polaroid sunglasses. It wasnt long before we spotted several big fish darting off the shoal over the drop-off and into deep water. We anchored where the fish were seen and set up floating lines, long leaders and weighted leech patterns. Our plan was to cast the leeches parallel to the edge of the steep drop-off, wait for the flies to sink close to the bottom and then retrieve slowly back to the boat. No action occurred for the first 30 minutes and then I noticed a bloodworm, or a maroon chironomid larvae floating by in the surface film of the lake. 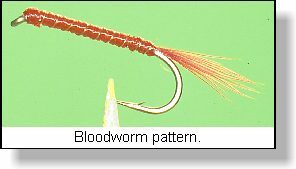 Lights began to flash in the fishing section of my brain and we quickly switched to weighted bloodworm patterns and fished them the same way we had been fishing the leeches. I hooked a fish on my second cast. I could tell the fish was heavy by the way it was shaking its head as it headed out for deep water. We ended up pulling anchors and chasing the fish as I did not have enough backing to stop the long runs. We took a length and girth measurement and pumped his throat prior to release. To our excitement, the large male fish was feeding on big maroon chironomid larvae. We quickly re - anchored and landed another 5 fish that were all over 3 kg before the wind came up and iced-up rod guides made casting and retrieving too difficult. Trout feed aggressively during the last 6 weeks prior to freeze-up in order to build up fat reserves for the long winter ahead. Highly sought after food items include shrimp , leeches , water boatman , chironomid pupae and larvae, dameslfly and dragonfly nyphs. All of these food sources live in the shoal or drop-off zones of the lake or in water that is generally less than 6 metres deep. Often the best fishing action will be in 2 metres of water or less, right tight to shore. Some lakes offer excellent wading opportunities as the fish are feeding that shallow. This shallow water feeding often allows the angler to use a floating fly line in combination with varying leader lengths and weighted or unweighted flies. Chironomid larvae or bloodworm fishing is especially good late in the fall as these worm-like larvae get swept off the bottom as the lake is mixing from wind action. This is how the larvae get trapped in the surface film. Trout love to eat these hemoglobin-filled larvae and the observant angler can cache in on this feed action. The most important late fall food item are the protein rich Gammarus and Hyallela shrimp. Grammarus, the larger of the two species, can reach almost 15 mm in length, while Hyallela rarely exceed 3 mm in length. Both are found in the productive lakes of the interior region of the province. Gammarous are most commonly found in the bottom vegetation growing on the shoal zones of the lake. Hyallea frequent the whitish/yellow marl bottom of shoals that are common in very clear lakes. Remember to fish your patterns close to the lake bottom and try to match the colour of the shrimp present in the lake your are fishing. Shrimp, like other trout food sources vary their colouration to the colour of the shrimp present in the lakes your are fishing. Shrimp, like other trout food sources vary their colouration to the colour of the water and habitat they are living in. Leeches are always a good fall pattern because they are readily available and also a big food item. I have found the best colours to fish are maroon, black and maroon, dark green and brown. Try using patterns that have some flash to them or a bead head that gives the fly a bit more action during the retrieve. Woolly buggers in the above mentioned colours are always worth carrying in your fall fly box. 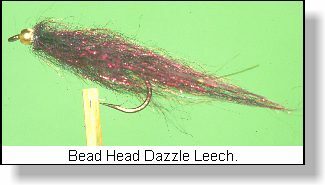 Try a slighter faster strip retrieve to get those really big trout excited. Anglers can also encounter hatches of smaller-sized chironomids late in the fall. 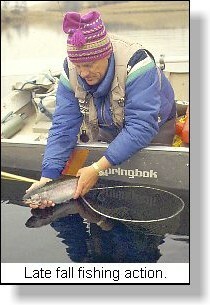 The trout are already very familiar with these hatches and will readily feed on them. Remember you wont see big sized pupa as was the case in the spring. Be prepared will patterns tied in sizes #14 to #16. Fall fishing does not last long but those that are prepared to fish in cold weather can have some spectacular action that will continue right up to complete ice cover.